The ripe fruit of the herbaceous plant Alpinia oxyphylla Miq. of family Ginger. Mainly cultivated in Hainan province and also cultivated in Guangdong and Guangxi provinces of China. Collected the ripe fruit after it turns from green to red in summer and autumn. Specially fragrant, pungent and slightly bitter. Get the kernel after stir-baked with sand and shelled, unprocessed or stir-baked with salt solution slightly. Smashed before using. Sweet, pungent, astringent, warm; kidney and spleen meridians entered. Tonify kidney yang, secure essence and reduce urination, warm spleen yang, check salivation, check diarrhea. It is indicated for seminal emission; spermatorrhea, enuresis and frequent urination due to kidney yang deficiency, deficiency cold in lower energizer, because it can tonify kidney yang, and also can secure essence and reduce urination. It can both tonify and astringe, therefore, it treats both the branch and root of the disease. But it is more astringent than tonifying, especially good at reducing urination. 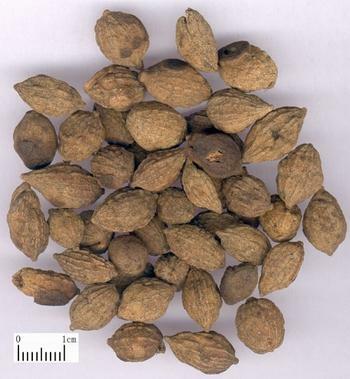 For enuresis and frequent urination due to insecurity of kidney deficiency, it could be used as main herb and combined with other herbs of tonifying kidney, securing essence, warm kidney yang and dispelling cold, for instance, it is used with Shan Yao and Wu Yao, in the formula Suo Quan Wan from Fu Ren Da Quan Liang Fang. For seminal emission and spermatorrhea due to kidney yang deficiency, it is combined with other herbs to tonify kidney, secure essence, for instance, it is used with Rou Cong Rong and Long Gu, in the formula Gu Zheng Dan from Wei Sheng Bao Jian. It is very suitable for excessive-salivation due to fluid ascending caused by hypo-activity of spleen yang, dysfunction of security, or kidney yang deficiency, dysfunction of qi transformation, because it can warm and tonify spleen and kidney, and it is also good at checking salivation. It could be used singly or combined with spleen and kidney warming and tonifying herbs, for instance, it is used with Fu Zi, Dang Shen and Bai Zhu. It can tonify yang of kidney and spleen, for diarrhea due to spleen yang deficiency, or both spleen and kidney yang deficiency, it is combined with spleen and kidney warming and tonifying herbs.